HOT PINK style: Fall is Here! As I mentioned before I wasn't always the biggest fan of this oxblood color. This Vintage Coach bucket bag was an Ebay purchase from years back. As happens more than I care to remember, the items pictured color was not what I expected when I opened the package and it left me disappointed. It's been sitting in my closet for a few years now, but I am thankful I hung on to this vintage bag because it goes so well with my new oxblood boots! Today it came out of its dust bag to make a grand appearance for the first day of fall. 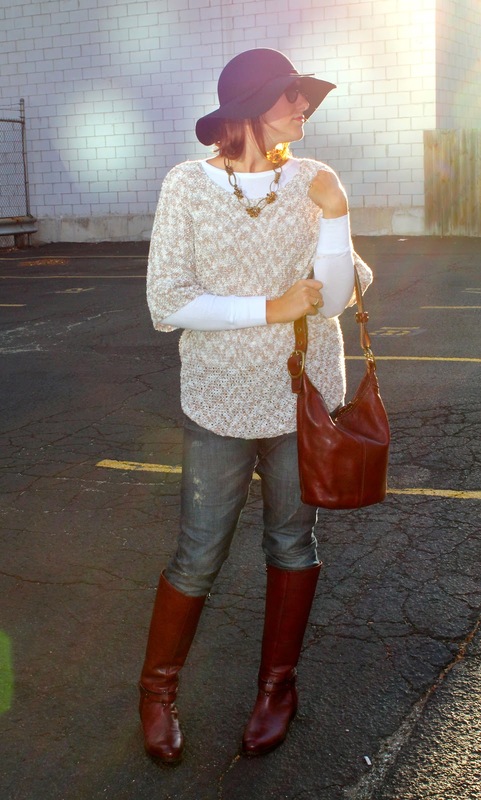 What a fabulous, comfy, lovely Fall outfit! Absolutely loving the last picture of you, too. Thanks! It certainly was cozy! We need to do another "fashionable friends shoot" with you!